Kiani-Rashid, A., Edmonds, D. (2005). Carbide Precipitation in the Microstructures of Austempered Ductile Irons Containing 0.48% and 4.88% Al. International Journal of Iron & Steel Society of Iran, 2(2), 1-8. A. R. Kiani-Rashid; D. V. Edmonds. "Carbide Precipitation in the Microstructures of Austempered Ductile Irons Containing 0.48% and 4.88% Al". 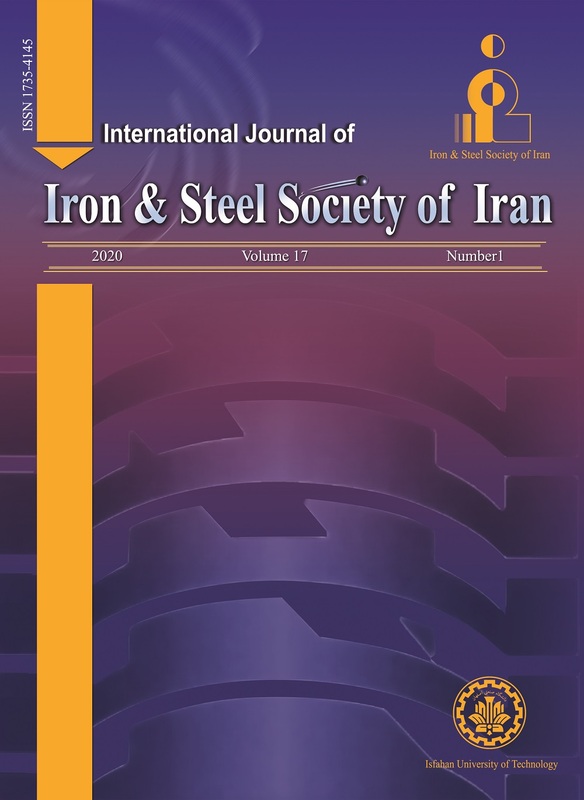 International Journal of Iron & Steel Society of Iran, 2, 2, 2005, 1-8. Kiani-Rashid, A., Edmonds, D. (2005). 'Carbide Precipitation in the Microstructures of Austempered Ductile Irons Containing 0.48% and 4.88% Al', International Journal of Iron & Steel Society of Iran, 2(2), pp. 1-8. Kiani-Rashid, A., Edmonds, D. Carbide Precipitation in the Microstructures of Austempered Ductile Irons Containing 0.48% and 4.88% Al. International Journal of Iron & Steel Society of Iran, 2005; 2(2): 1-8. The influence of aluminium on the microstructure of austempered ductile cast iron (ADI) has been studied. The presence of well distributed graphite in the matrix, and a relatively high volume fraction of retained austenite are responsible for the good mechanical properties of the Aluminium alloyed austempered ductile irons including excellent wear resistance, higher resistance to thermal shock, better graphitising tendency and higher resistance to oxidation at high temperatures. A number of specimens of different composition have been made by green sand-casting and gravity die-casting. The transformation to a bainitic microstructure during austempering under different conditions was then examined for the most successful experimental casts. Austenitising temperature of 920°C, and austempering temperatures of 350°C at different holding times have been used. Microstructures have been examined by scanning electron microscopy (SEM) and transmission electron microscopy (TEM). Furthermore, it was found that isothermal transformation at 350°C for different soaking times gave a typical bainitic microstructure. Extension of isothermal transformation time leads to precipitation of carbides which also depends on the Al concentration. H. K. D. H. Bhadeshia: Bainite in Steels, The Institute of Materials,CambridgeUniversityPress, (1992), 181. H. K. D. H. Bhadeshia and D. V.Edmonds: The Bainite Transformation in a Silicon Steel, Metallurgical Trans., American Society for Metals and the Metallurgical Society of AIME, 10A (1979), 895. J. Aranzabal,I.Gutierrez and J. J. Urcola: Mater. Sci. Tech., 10, (1994), 728. L. Sidjanin, R. E. Smallman and S. M. Boutorabi: Mater. Sci. Tech., 10, (1994), 711. A. Honarbakhsh-Raouf: Ph.D. Thesis,UniversityofLeeds, (1997). J. M Mallia: Ph.D. Thesis,UniversityofMalta, May (1998). M. J. Perez, H. Calderon, E. Valdes and M. M. Cisneros: A Microstructural Study of Austempered Ductile Iron Using TEM, Electron Microscopy, Vol. II, (1998), 225. S. M. A. Boutorabi, J. M. Young and V. Kondic: Trans. Japan Foundrymen’s Soc., 12 (1993a), 14. S. M. A. Boutorabi, J. M. Young and V. Kondic: Hardness and Tensile Properties of Austempered Aluminium Containing Ductile Iron, Int. J. of Cast Metals Res. (UK), 6 (1993b), 170. A. R. Kiani-Rashid: The Influence of Aluminium and Heat Treatment Conditions on Austempered Ductile Irons, Ph.D. Thesis, University of Leeds, (2000). J. G. Pearce and K. Bromage: Copper in Cast Iron, Hutchinson & Co. (Publishers) Ltd.,London, (1965), 13. H. T. Angus: Cast Iron, Physical and Engineering Properties, Butterworths & Co (Publishers) Ltd.,London, (1978), 131. A. R. Kiani-Rashid and D. V.Edmonds: Graphite Phase Formation in Al–Alloyed Ductile Irons, Int. J. ofEng., 15 (2002), 261. R. P. Walson: Aluminium Alloyed Cast Iron Properties Used in Design”,AFSTrans., 85 (1977), 51. R. J. Smickly and K. B. Rundman: The Effect of Aluminium on the Structure and Properties of Grey Cast Iron,AFSTrans., 89 (1981), 205. H. K. D. H. Bhadeshia and D. V.Edmonds: Bainite in Silicon Steels, New Composition-Property Approach Part 1, Metal Sci., 17 (1983), 411. S. M. A. Boutorabi: The Austempering Kinetics, Microstructure and Mechanical Properties of Spheroidal Graphite Unalloyed Aluminium Cast Iron, Ph.D. Thesis,UniversityofBirmingham, (1991). R. Elliott: Cast Iron Technology, Butterworths & Co. (Publishers) Ltd.,London, (1988). L. Sidjanin and R. E. Smallman: Metallography of Bainitic Transformation in Austempered Ductile Iron, Mater. Sci. Tech., 8 (1992), 1095.